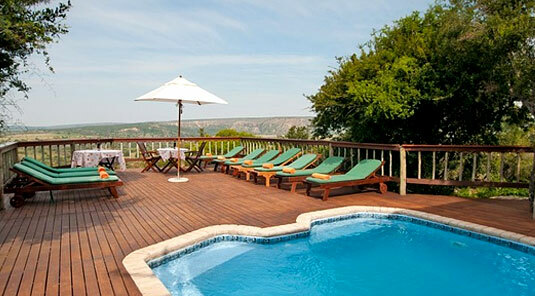 The Four Star, Woodbury Lodge in the Malaria free Amakhala Game Reserve, is set adjacent to a beautifull gorge and cliff face above the plains and valley of the Bushmans River in the Eastern Cape. 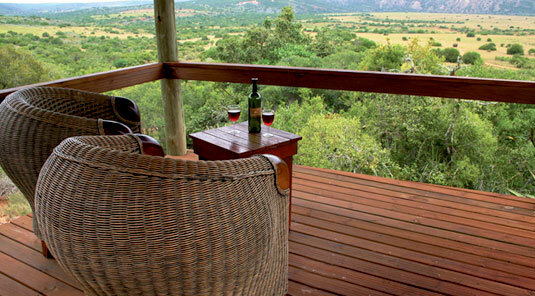 The views from the main lodge deck and the chalets is out over the open plains below.The Gush family, owners and hosts, endevour to make ones stay most enjoyable. 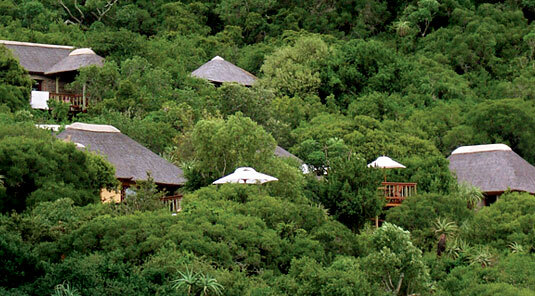 Friendly staff, knowledgeable guides, comfortable accommodation and amenities, good food and exciting game viewing, make this a venue of choice in the Big Five Amakhala Game Reserve only some 45 minutes drive from Port Elizabeth. 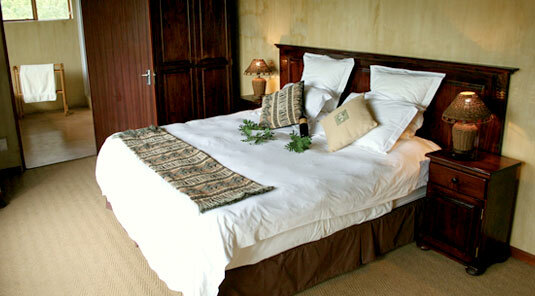 Guests at Woodbury Lodge are accommodated in 5, stone under thatch Chalets, each with full bathroom en suite. 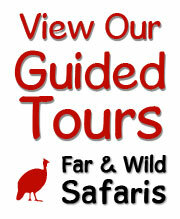 The rooms are air-conditioned and have large double beds, comfortable chairs and recliners. 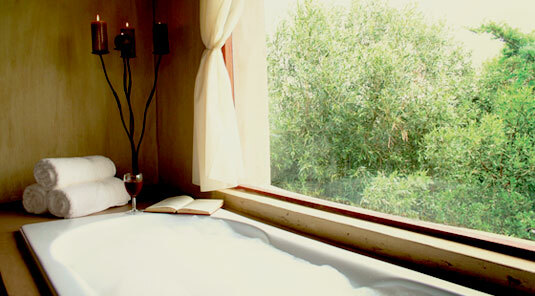 there is a bar fridge and tea station with an assortment of current magazines and magnificent views. 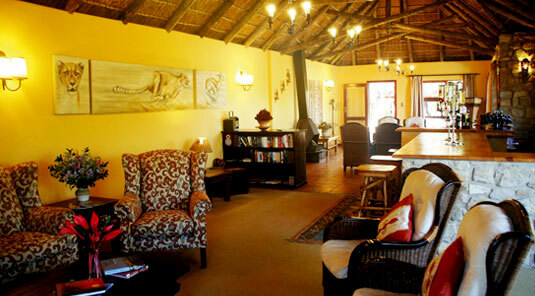 The main Lodge has a lounging area, a bar, internet, a swimming pool and sun deck with comfortable recliners. 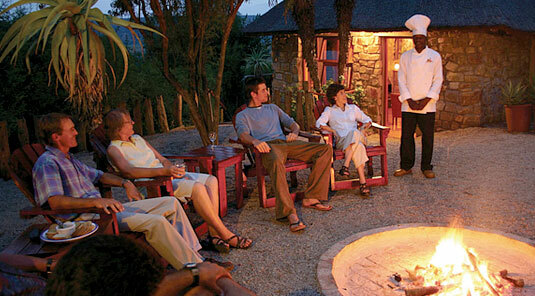 Adjacent to this is a boma area where dinners around a fire under the stars can be enjoyed. 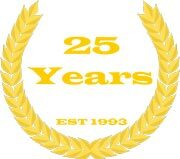 A lovely touch is that the dinners are hosted alternatively by one of the owners and the rangers. There is also a dining room for dinners and view deck which is where one has breakfasts and lunches. 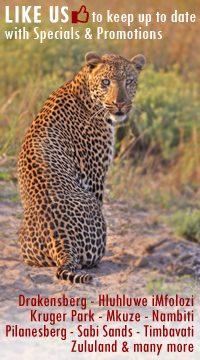 Early morning and afternoon into the evening guided game drives are offered on the Amakhala Game Reserve with experienced game rangers adding value to the experiences and sightings. 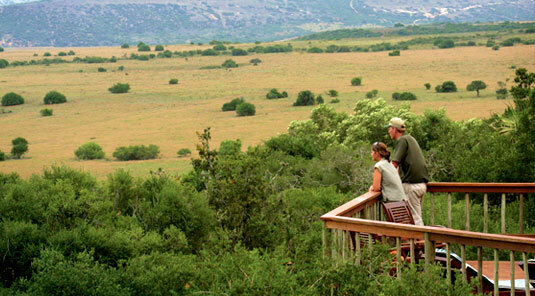 For a change of pace one may also enjoy bird watching and game spotting walks along the Bushman's River, or what about a cheese and wine boat cruise, or for the more energetic a sundowners canoe safari.